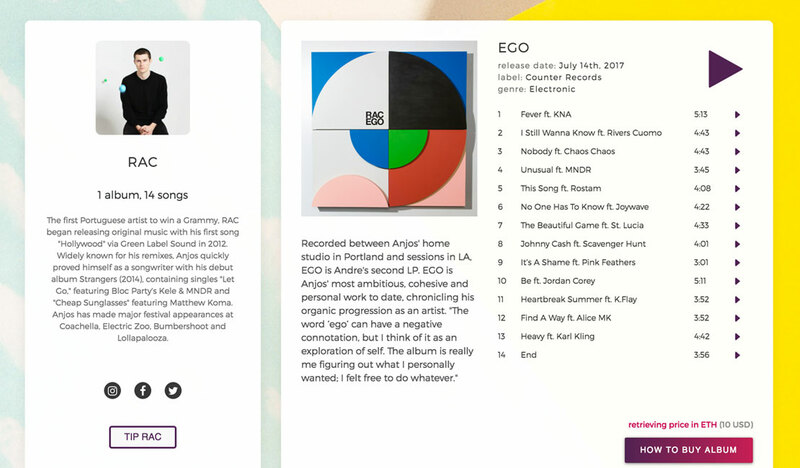 Last month, dance artist RAC – aka André Anjos – released his new album EGO through the usual channels. But he also launched his own webstore selling the album using the Ether cryptocurrency. This was billed as the first full-length album to be distributed using the Ethereum blockchain platform. RAC worked with startup Ujo Music, which previously helped Imogen Heap release her ‘Tiny Human’ track in a similar manner in 2015. “I don’t think this is going to replace Spotify or iTunes, but being able to support the artist directly is pretty important,” said Anjos ahead of the launch. It quickly became apparent that he was right. “On the first day of the RAC release, he made more money from tips than he did from sales. People were excited about this, and about him supporting Ethereum,” Ujo Music co-founder Jesse Grushack tells Music Ally. Fans could choose to tip RAC on top of the price – equivalent to $10 – of the album. It’s fair to say this isn’t a barrier-free transaction. It relies on fans having Chrome plugin MetaMask installed, as well as having some Ether currency to hand – the getting of which involves a Google search at least. “This is more for the Ethereum community right now. When you have MetaMask it’s seamless: two clicks to buy the album. If you don’t have that, it’s a little more arduous: you have to figure all this stuff out,” says Grushack. EGO is a glimpse at Ujo Music’s bigger plans to build a platform for many artists to launch their own blockchain-based stores – including taking credit card payments, a feature which wasn’t quite ready for RAC – but also using ‘smart contracts’ to control the licensing and distribution options for their music. More than 1,400 artists have already registered their interest with the company. Those who wholly own their rights will be able to release their music; fill in metadata fields including songwriters, performers and producers; and set the splits so that royalties can be paid out automatically. Ujo has previously described this as “a global, open, decentralised, machine-readable licensing system: owned by no-one in particular, but simultaneously owned by everyone” where artists set the distribution policies for their music, and then apps or startups that match those policies can use the songs. 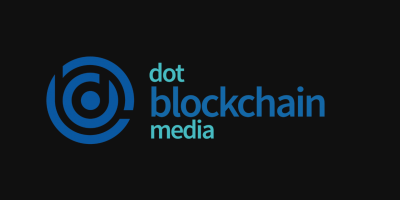 “We hope to see things like a young duo build an innovative radio service over a weekend without having to go knock on the doors of the record labels,” blogged Ujo’s smart contract lead Simon De La Rouviere recently. EGO is interesting for another reason: this isn’t an example of an artist who owns all his rights and has opted out of collecting societies experimenting with the blockchain. RAC is signed to independent label Ninja Tune, with publishers and collecting societies also involved for him and his collaborators. “André has a publisher, all the artists he collaborated with have publishers […] We did it in a way where we have a licence with the label: a deal to distribute this, and the money will go to the traditional measures for the payments,” says product lead Jack Spallone. One key aspect is the fact that anyone buying the album gets an EGO token – an official blockchain record of their purchase. “We have no idea what we’re going to do with this, and nor does RAC. But he’s excited: there are so many cool things he could do, like invite people to come and hang out 30 minutes before a show, to using it as a presale list for his next tour,” says Grushack. This isn’t unknown. Spotify, for example, is working with some artists to offer presales and merchandise discounts to their keenest streamers, while services like Bandcamp and Patreon work on the basis that a purchaser becomes a member of a core community for an artist. “It’s a reputational component to the consumption of music. In a way, it sort-of self-regulates piracy: if it takes off, you can have the bragging rights: ‘I purchased this album on Ethereum,’” says Spallone. When Ujo talks about fans’ ownership of/licences for music in a blockchain world, its views are similar to those of other blockchain startups in terms of people buying music from one service and having the licence to use it in another. “It would be really cool if your music and all the data was persistent and attached to you, rather than locked to an application, so it could move across different music applications,” says Spallone. Most of what Ujo Music is doing sits outside the traditional music-industry structures: collecting societies, publishers and labels, and the company has firm views about the challenges involved for anyone taking a different path. “The adoption – and the desire for adoption – from those established companies is minimal. A lot of them make money from being opaque. They don’t make money from being transparent,” says Grushack. Spallone agrees. “These are old, archaic systems that are not effective in the digital age. And the companies trusted to enact these legal processes will not let go of their control,” he says. Grushack says that Ujo Music’s focus now is on “the middle-class of artists” who just want to make a living from their music: $50k-$80k a year, maybe. “It’s really hard to do that: the stigma is that you’re either a starving artist or a rock star. But how do you just become a musician, without having to go on tour 300 days a year, or living on ramen in an apartment with three other people?” he says. 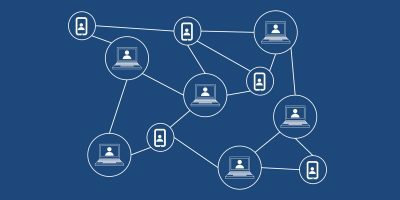 Spallone says that there are parallels between the blockchain space today and the philosophy of the filesharing community that brought such disruption to the music industry in the late 1990s onwards. But with one crucial difference. 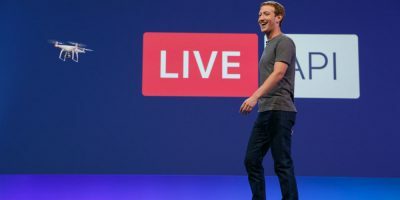 “It’s exciting that we’re now applying the same sort of disintermediating technology that disrupted this industry and basically ripped all this value out of it, but that we’re trying to apply legitimate business models on top of it, in a way that puts money back into creators’ hands,” he says.